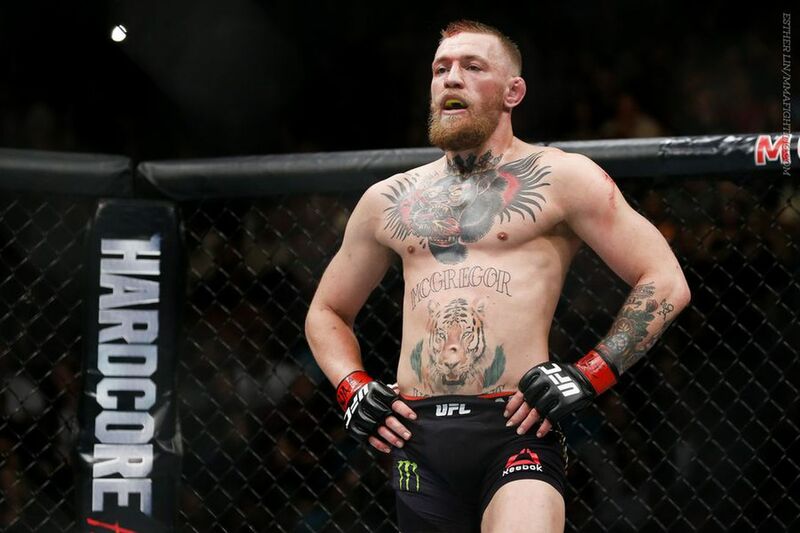 In what proved to be another quintessential epitome of the irresistible rollercoaster ride that is mixed martial arts, Conor McGregor was handed his first loss inside the Octagon after tapping out to Nate Diaz in the second round - the questions fired by the hard-to-please critics were answered, whether in a good way or not. All the components were in functioning order when the cage door slammed shut for the main event of UFC 196 in Las Vegas. From the physics of the size discrepancies to the jiu-jitsu credentials of the American, along with the game plans of both fighters, it was a puzzle to solve for the entertaining 9 minutes and 12 seconds which it lasted. Barring a few seconds of clinching up against the cage, the first frame was essentially a more flexibly sanctioned boxing match along with the champion's kicks and plenty of space. Conor McGregor was head hunting early, looking for the trademark left hand, although Nate Diaz was demonstrating his iron chin; taking everything the Irishman could throw at him - even if he was sporting a cut after because of the strikes. The Featherweight Champion aimed to close the distance by using his fluid movement to get inside, but while his success was often, it wasn't enough to really rattle and throw off his opponent in the early stages, forcing him at times to really overdo it - although that can only really be deduced in hindsight. Head movement was key in the first round as McGregor slipped Diaz's punches and vice versa, Nate himself coming with a cluster of jabs but the Notorious one overall a clear winner in the opening frame. A late takedown from Diaz showed promise for his opponent's camp when he turned it round forcing the American to pull guard, an underrated bit of work, concluding a captivating 5 minutes of fighting. In the second round, it became more clear that the red-corner fighter was stuck on the outside at the end of Nate's range. His early spinning kicks to start the round didn't find the target, while he was continuing to have to explode and lunge forward to try and find the chin while Diaz continued to counter and keep out the way. It remained poised on a knife edge; until a pivotal one-two combination sparked the beginning of the end for the Notorious one. Wobbled on his feet and stunned by a shot for the first time in his UFC career, the complexion of the fight was significantly altered. Perhaps a little too lethargic, being caught by that big shot and wobbling was a moment in which McGregor would never regain his bearings. While the Irishman would continue to fight back with numerous combinations, nothing seemed to stifle Stockton's own. Up against the clinch, further damage was done with Diaz landing cleanly and often, his opponent unable to stop the damage until an eventual breakout. The two traded wildly, with some body shots by Diaz who began to feed off the change in momentum. Visibly stunned at the events unfolding and stamina deteriorating, McGregor was in dire straits and shot for an emergency takedown - to his demise. As soon as the fight hit the mat, Diaz worked a Guillotine choke but the Featherweight champion, similarly as he had done to Chad Mendes back in the summer, escaped it. This time however, he wouldn't get back to his feet; he couldn't. Instead, he was in the discretion of the American's mercy, as he transitioned easily and fluently from side guard to full mount, hammering down shots before McGregor gave up his back in an attempt to stop the damage, but also allowing Diaz to secure a rear-naked choke, followed a few seconds later by the tapout heard around the world. This was the Notorious' first fight in the Octagon to not be contested at Featherweight. Rather than the usual 145 lbs, he fought 25 lbs higher at Welterweight - even more than the initially planned jump for the Lightweight title fight. Not only was he now venturing in unfamiliar waters, but for the first time in his UFC career, his opponent had a height and reach advantage. It was almost strange, the sight of McGregor being the smaller man in the cage. As a result of this, he was forced to lunge in at times to try and close the distance and land the left hand shot - which had slept the pound-for-pound king and other perennial Featherweight contenders - but to no avail as his opponent seemed unfazed, despite a cut to the right eye. 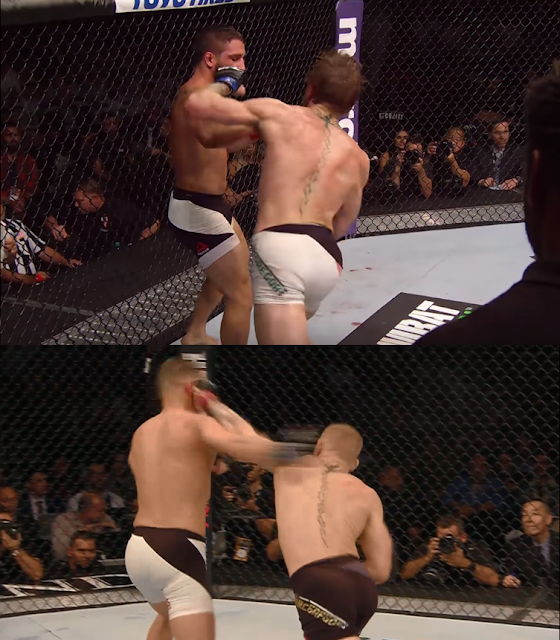 Conor McGregor attempting to land similar shots on Chad Mendes (top) and Nate Diaz (bottom). Due to the reach advantage, McGregor must force a lot more weight and lean on the front foot compared to Diaz, making it a lot harder to connect, and leaving himself susceptible to counter punches. What McGregor often used as a straight left to put the lights out evolved into an overhand left at some stages. With the height discrepancy the distance would need to be closed by stepping forward, getting the head off the centre line and trying to tag Diaz - even when he did though, it didn't work. He would pay the price later. With the Irishman's fighting style he is prone to receiving shots as he gives them, but counter-punching had all the more effect with Conor on the outside. Even when landing some, a counter hook from Diaz was always there, and again they may have took their toll. Perhaps this could be the reason why weight classes are a thing in mixed martial arts, in fact combat sports as a whole. The punches that had put away the best of the best 25 lbs lower did land on the chin of Diaz, but nothing forced him to really back track. But then again, the fight could have been made at Lightweight which is a somewhat standard operating field for both men; however the power and effect of those shots changes with 15 pounds. Boxing Science did some great work on how the jump in weight affected Conor's performance. Quoting the length-force relationship, an interesting point was made that McGregor was landing at the end of the reach range rather than mid-range punches, the latter of which are far more effective. The muscle, as a result will be stretched reducing the action due to stiffening up on impact as the elbow locks out. They also went on to discuss the aspect of energy which the 145 champion explained lead to his downfall. Even some mathematics was used as Danny Wilson of Boxing Science explained the difference in energy demands with McGregor's jump in weight. To compensate with the 25 lbs increased weight, there would be an increased energy demand, which also wouldn't be helped by the Irishman throwing powerful shots throughout the fight. Let's say his aerobic capacity is 4 L/min. At featherweight, his relative oxygen uptake is 60 ml/kg/min. Now, let's say his aerobic capacity changes because of his increase in muscle mass to 4.2 L/min. At welterweight, his relative oxygen uptake actually decreases to 54.5 ml/kg/min. So to combine with McGregor's change of fighting tactics - aggressively charging towards Diaz with all the shots in his arsenal - the need for energy and strain on his gas tank was increased too, making it a fatal combination in which his opponent punished at UFC 196. In recent fights, Conor was more relaxed and awaited his opponents to charge at him while still retaining most fundamentals of a pressure fighter. However, in this instance, he was adamant on controlling the centre of the Octagon, charging forward with powerful shots in a manner which seemed unusually aggressive in comparison to other occasions. While he has charged at previous opponents before to throw them off their game, coming out of the blocks swinging and not stopping until the fight was done was significant. Whether it was a case of the mental warfare ramping up McGregor to take out Diaz, or an illusion that he could go further at 170, to go with all the adrenaline on fight night will be under speculation, but either way it was a huge error on his part - and he admitted so, telling Joe Rogan "I was inefficient with my energy" following the fight. Nate Diaz may have struggled as well but he certainly didn't show it, the triathlon training and constant presence in the gym allowed him to keep on going, plus he wasn't the aggressor for the most part. In addition, he was more familiar with these instances than McGregor - Diaz has been through thick and thin with adversity. Size, however, is far from the be-all and end-all of this tale. Nate Diaz's chin was rock solid at UFC 196, just like all the other fights in his career. There's no doubt that McGregor landed clean with his signature left hand throughout the fight, yet he wasn't rocked, he kept on soldiering forward. When you have a man who has so much faith and confidence in his power as McGregor did, and clearly had the right to with his meteoric rise to the top of the game, the prospect of someone being able to take those shots and fight on is a daunting and puzzling one. The effect on the mindset can't be played down either: you have McGregor on one hand, landing with the shot in which he has put away other opponents on course to victory while Diaz has taken his best shots and still well in the fight. Again, this is in hindsight - in the first round interval, the ship was sailing where McGregor wanted it to go, since he controlled the fight and the exchanges. It was one of those X-factors that no one could prepare for or forecast. The chin is always a mystical concept in mixed martial arts, sometimes it can take everything you can throw at it, other times it will crumble with just one connection. There was just no way of telling, but one thing is for sure, however Aldo, Mendes and previously vanquished McGregor opponents fared in the cage, Diaz's chin caught him by surprise - testament to the true warrior spirit embodied by #209. In a sport with so many variables and different complexions, things can easily fall under the radar. One that definitely did on fight night was the body shots. We've seen McGregor butcher previous opponents by targeting the body and that should have been a route to victory at UFC 196 - with the chin out of range on many occasions, targeting the patented left hand to the torso would have done damage. Towards the end of his interview with Megan Olivi, the Notorious One discussed the body shots further. "I hurt him a couple of times to the body then he hurt me at one stage to the body, and then I abandoned the body," he explained. That instance in which the American hurt him to the body was probably in the clinch in the final moments before the fight hit the mat for a conclusive final time. 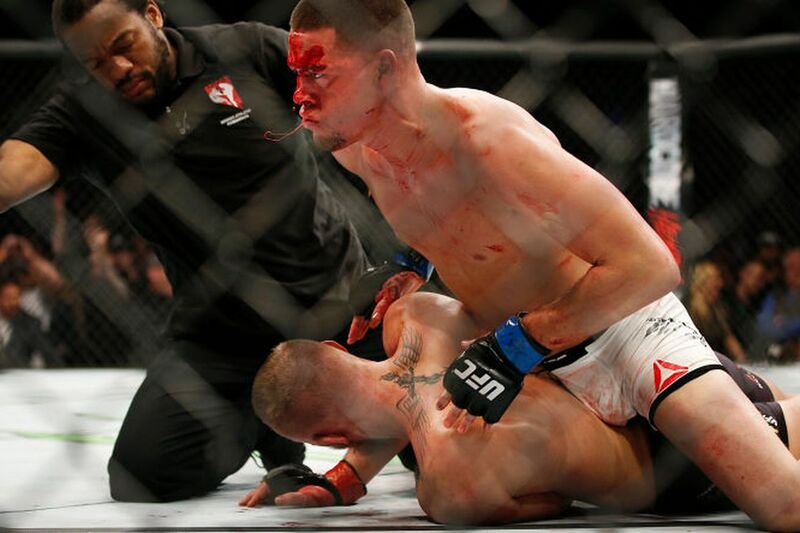 Being pushed up against the fence, Diaz was landing with shots to the face but also landed with a knee to the body on at least two occasions, which the winning fighter admitted the effect, hearing his opponent grunt when the strike landed. Not only did that slow McGregor down and have a detrimental effect on his cardio, but it also made him wary of engaging in further strikes to the body. Had he went there though, the fight may have turned out a lot differently. Being pushed up against the cage wasn't the only bit of grappling on the agenda in the main event. A lot more questions were asked and mysteries were unearthed, ultimately the fight was determined in the exchanges, also. An early first round clinch was survived well by the Irishman, and later on in the round he would show some exquisite aspects of his grappling - a swift ankle sweep to finish the first frame on top, showing promise should the fight have hit the canvas later on. However, when Diaz was pouring on the heat midway through the second round, McGregor's grappling fundamentals seemed to fail him. He was unable to gain wrist control as Diaz pounded shots to his skull up against the fence, and just couldn't stop taking the damage. It also made him prone to the knees which would have their impact. Despite numerous attempts to lock down that left arm, McGregor just couldn't manage. That could be due to his lack of grappling ability, fatigue or reach but being torn up in those late clinches were a crucial aspect to the loss. Diaz made sure he didn't let McGregor recover in the clinch. As Conor described, he went into "panic mode" when Diaz was reigning down the shots hence the sloppy takedown. We thought he answered the infamous wrestler question with his interim title win over Mendes but its risen to prominence yet again: unlike his usual ice-in-the-veins self, he went for a takedown in an act of survival, leaving him at the peril of skilled jiu-jitsu. Rolling round to escape the Guillotine choke, the Featherweight champion may have got back to his feet had it not been for a beautifully executed leg trap not once, but twice to stop him getting into the side position. It meant that even if he did escape the choke, Diaz would be in a position to still be on top, and the fight was over as soon as he was in side control, McGregor could not defend the smooth transition to mount. Diaz's knee was kept glued on to McGregor's body as he slid it over for the full mount - fundamentals, but his opponent was out of it to even defend. From there, the panic mode did the thinking for him, Diaz landed the big shots, McGregor turned his head and Nate new exactly where his arms were going for the choke. Incredible ground fighting from Diaz, a lethal combination: those who can't strike with him look to the ground for comfort, but there the threat gets even worse. 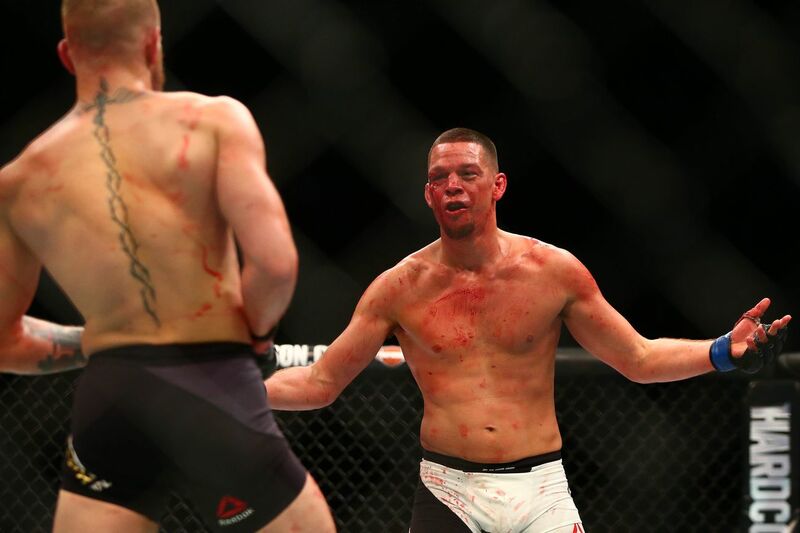 Both men were put through their paces on the night - Nate Diaz was the ultimate survivor. At the end of the day there's no excuses, McGregor admitted that himself. Diaz took what he had and fought back, stumbled his opponent then spectacularly finished him on the feet - but it was far from a simplistic matter as you saw above. It is mixed martial arts after all. You must master each and every area of the fight, or suffer the eventual consequences. In a fight which McGregor said he would bring the martial arts back into the game, it was in fact Diaz who did so.